1) ?, ? ?, Poseidón vs ?? ?, ??? ?, ????? Scoria helped Cuervo get the win over Angelico. Psycho Clown was injured by Texano Jr - Psycho ended up with an ugly bruise around his right ankle. 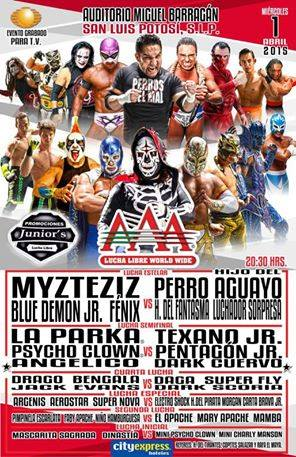 Changed around after Perro Aguayo's death. Fenix was originally on the trios side, and Mesias was probably supposed to be a mystery partner. Mesias snuck in a foul on Demon, then landed the top rope splash. Added to make up for missing Rey de Reyes. Turned into a street fight, with La Sociedad gettinv involved. Cage wanted a title match. Event Notes: Prior to the start of the show, a tribute was held for Perro Aguayo Jr. 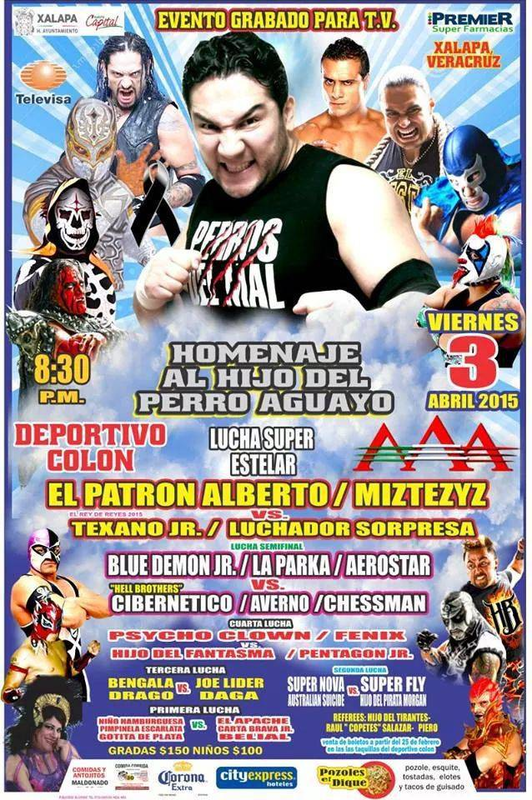 The roster came to the ring, and there were flowers and a poster of Perro. Marisela and Konnan are both noted as talking about Perro. All wrestlers wore a tribute shirt, and various wrestlers had other tributes (Fenix wrote Perro on his hand tape.) Building appeared to be full. Dinastia replaced Super Nova, but lost to Super Fly's triple powerbomb. 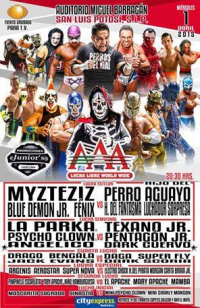 Turned into a singles match - Psycho Clown would later appear to explain he could not wrestle due to the injury he suffered in SLP and Pentagon Jr. was added to the main event. Fenix avenged his loss in Guadalajara by using his new Busca Suenos move again. 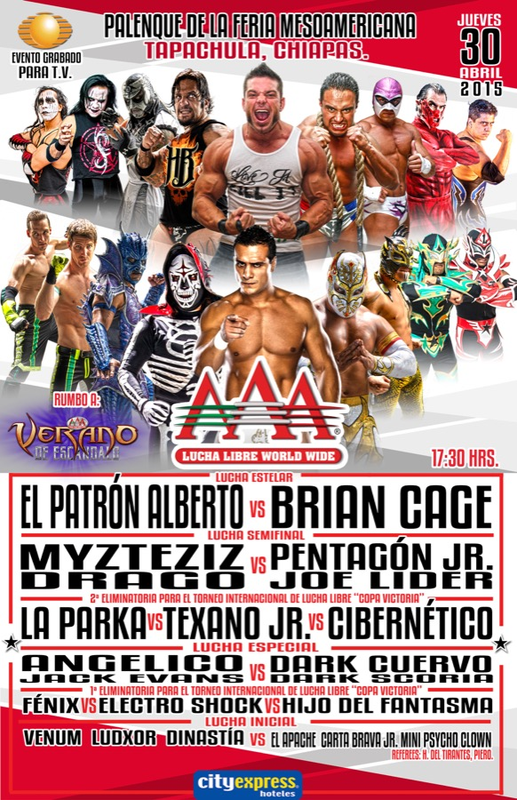 Event Notes: Show began with the wrestlers honoring Hijo del Perro Aguayo. Mini Psycho Clown beat Dinastia for the second time, asked for a title match. Fantasma defeated Electroshock to earn the first spot on the team. Fantasma interfered, and Tirantes and Cibernetico helped give Texano the second spoto n the team. Fenix replaced Drago. Mistica on Joe Lider for the win. Fenix & Myzteziz want another shot at the tag titles. Made no DQ. Cuervo & Scoria (randomly?) decided to help Cage, causing Angelico & Jack to even the odds and the match turned into a trios. Alberto beat Cage.